Creating a funnel allows you to track the drop-off percentage and conversion data of visitors at each stage of a process. 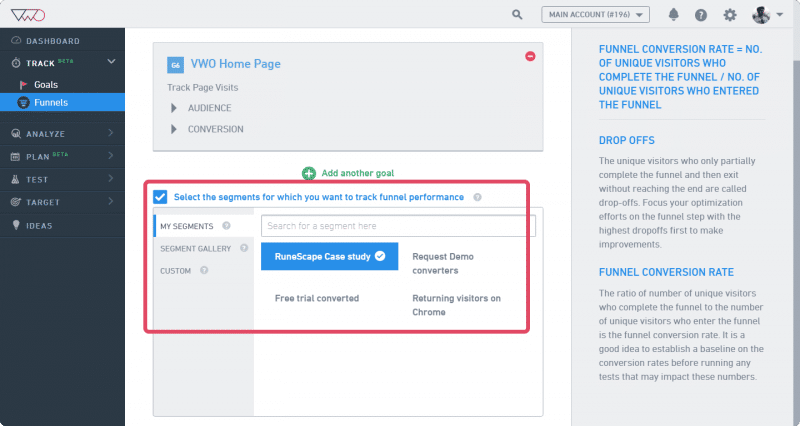 On your VWO Track dashboard, select the the Funnel option from the Create drop-down options. Track visitors landing on the Home page. Track clicks on the Pricing button. Track clicks on the Request a Demo option. Enable the segmentation option to target the funnel for specific visitor segments. Targeting funnels for specific visitor groups allows you to analyze the goal reports, based on the visitor segments you have defined. To learn how to create segments, click here. You can create a custom visitor segment or select one from the default segments. Create and save your frequently used segments in My Segments. Click Create to finish setting up the funnel. You can immediately start running the funnel or choose to start it at a later time.